We’re smack in the middle of another spring fishing season in Texas and the year’s busiest time for recreational boating — on freshwater and salt — is just around the corner. If you have ever thought twice about not wearing a lifejacket when a boat is underway, or launching onto big water when nasty weather is in the forecast, don’t do it any more. That’s Darrell Proffitt’s mantra and he’s sticking to it. But it’s only a tiny fraction of his story. Proffitt, of Center and his fishing partner, Brandon Lovelace of Port Neches, competed in the 2017 Rat-L-Trap tournament held Jan. 22 on Sam Rayburn. Months later, both anglers are still counting their blessings after a boating mishap brought them closer to death either has either been. Proffitt and Lovelace didn’t weigh in a single fish during the tournament, but they still walked away with a grand prize worth way more any sack of bass might have earned them. 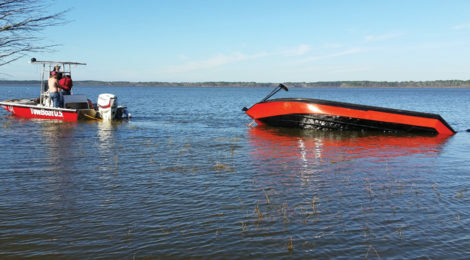 Proffitt and Lovelace narrowly escaped death on that fateful Sunday afternoon when Lovelace’s bass boat unexpectedly began taking on water for unknown reasons and sank as they made their way towards the boat ramp at Mill Creek Park, where they had launched roughly seven hours earlier.